Listening: Lately I have been listening, or shall I say watching, a lot of TV. Oh, how I love Gold Rush. Actually, I love any of Discovery's shows lately. But, I especially love Gold Rush. I love seeing hard working Americans pushing the limit, going to the edge to strike it rich. My 2 favorites happen to be Dave Turin and Parker Schnabel! I have days where I wish I could leave it all to spend some time in the Klondike digging for gold. 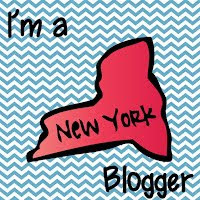 Loving: I am currently loving the extreme amounts of snow we have gotten this year for Christmas. I'm only loving it, however, because I haven't had to drive much in it. Wednesday we start back to school and I'd love for it to stop snowing so that I can have a safe and relaxing drive! Thinking: I can't believe tomorrow is the last day of Christmas break. As I scan my to-do list I see that I still have a lot of things that need to be crossed off. Too many to check off in one day. I always over plan when I have time off. Wanting: My class size has grown from 21 students to 23. 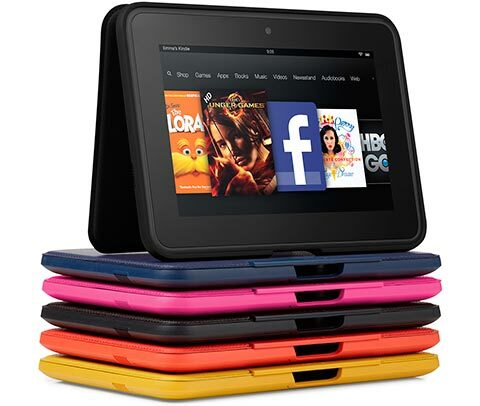 I am in much need of another Kindle Fire. I previously received 3 from Donors Choose and purchased a fourth with my own money. Students love using the Kindles during reading and math rotations. But, I like to group students in 5 groups and 3 groups now have 5 students (instead of 4) which means someone has to share. A Kindle is hard to share when you are in fourth grade. 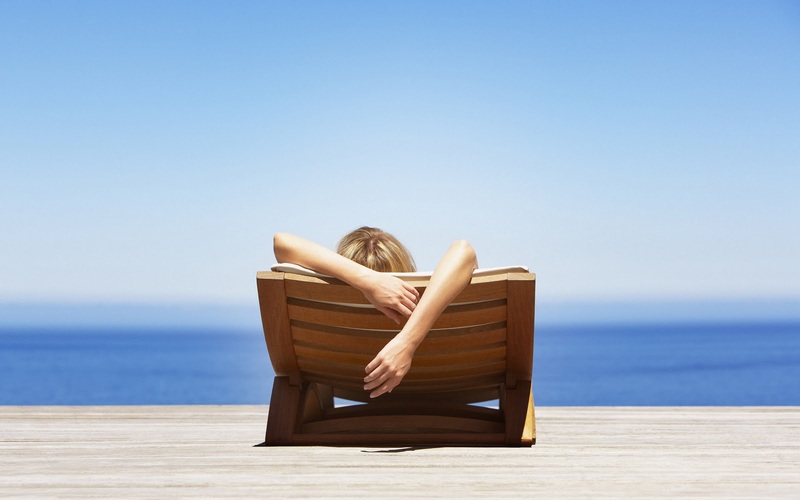 Needing: I've spent quite a bit of time this week relaxing and trying to rebalance my life. However, January is going to prove to be a stressful month. 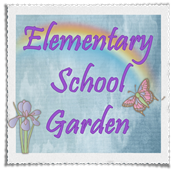 Data, lesson plans, meetings, observations, common core, and more. I need to revisit some of the stress relief strategies I've acquired over the years. One of my New Year's resolutions is to live a more balanced life and to make more time for family, friends, and myself. In regards to myself, I need to frequently remind myself to save time to relax and live in the moment rather than always planning, and worrying, about the future. Ahh, just looking at this picture melts my stress away! I need to plan a vacation sometime soon! OWL: My One Little Word for this month is: HOPE! Hope for today, hope for tomorrow, hope for a snow day, hope for an easy observation, hope to start a family, hope to live each day happy. My mother in-law got me this cute Angel of Hope. I've placed it by my computer so that I can start each morning with the hope that something wonderful will happen. That's all for now. 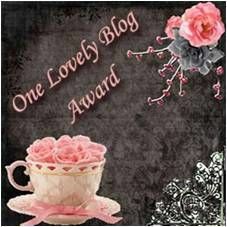 See you next year bloggy buddies! 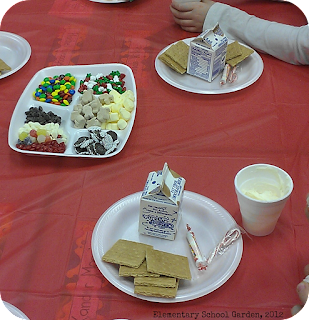 Last Thursday we had a fabulous Gingerbread House Party! Making gingerbread houses has quickly become one of my favorite activities! Young or old, this can be a fun activity for all. Hosting a gingerbread house party? Here are some tips to make your party a success! Tip #1: Quick and Easy Frosting! Our school is currently not accepting any baked goods from students or families. Everything must be store bought. 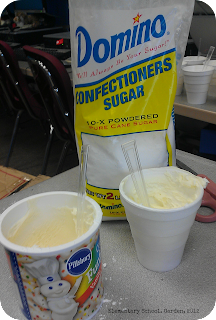 Rather than spend hours upon hours making homemade frosting, combine store bought frosting with confectioners sugar. I filled a Styrofoam cup about half way with frosting and added one tablespoon of the sugar for thickness. The frosting was a lot stronger and held the graham crackers together well. Use recycled (and cleaned) milk cartons for the base of the house. Students saved cartons from lunch. We opened them, washed them carefully, and glued them shut. Students simply stuck the graham crackers to the carton with frosting to make their house. Cartons were glued to plates for added protection while being transported home at the end of the day. These were extremely sturdy! I snagged some red tablecloths from the Dollar Tree this year. Not only did they add to our festive decor, but they were easier to spread out and clean up than newspaper. When you're done, simply roll up the tablecloth, along with all the garbage on top, and throw it away. Clean up was a cinch! Visit with family and friends. We have a little bit of traveling to do this week. 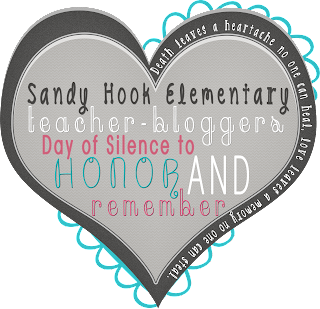 Create some new products for my Teachers Pay Teachers store. I hope to create some seasonal math word problems for winter and Valentine' s Day, writing prompts, a poetry unit, and something fun for fractions. I plan to take a few days of break to be a working machine! Clean and reorganize my home office. I started reorganizing a few weeks ago but got side tracked and never got a chance to complete it. Create a binder to organize my store and blog information. Bang out some super duper blog posts and schedule them in advance to get a head start on this upcoming month. January is going to be crazy. If I don't post some now, I may never get to it! 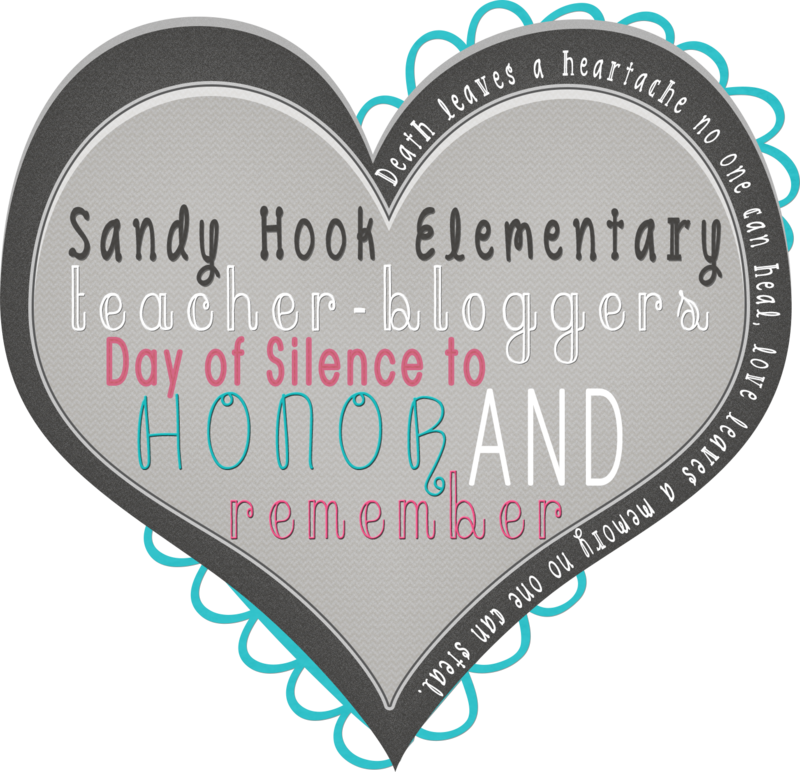 Plan out the month of January and create some new lesson plans. My second observation is happening this coming month and it's a random pop in. The pressure will be on. What are your plans for Christmas Break? Link up and share! Hey all! I'm just popping in real fast to say my observation went well on Thursday. I wanted to share with you 2 writing response sheets I created to go along with one of my favorite Christmas books: Auntie Claus! Every holiday season Sophie's aunt, Auntie Claus, mysteriously disappears on a strange business trip. This year Sophie is determined to discover her aunt's destination. She stows away and follows her to the North Pole. 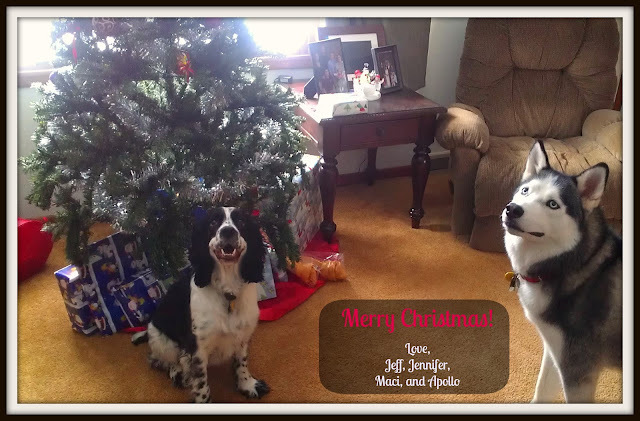 In the end, Sophie learns the number one rule for Christmas: It is far better to give than it is to receive! You can download my two writing responses that accompany the book here free at google docs! I've received a few requests to sell my writing prompts on a stick separately. 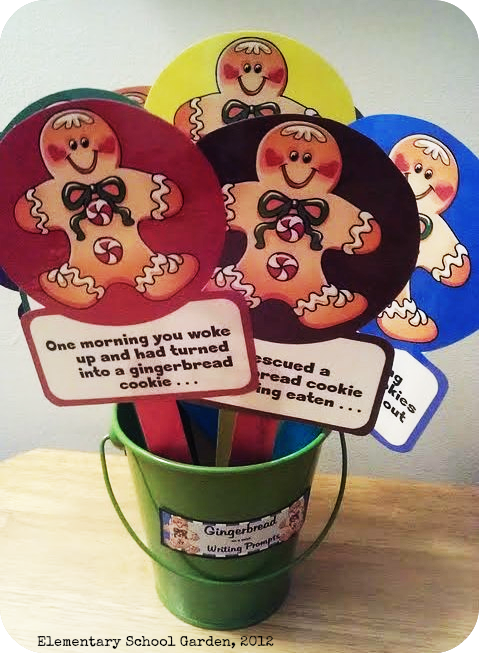 I'm not ready to divide up my Gingerbread on a Stick prompts but I've created some new ones for you: Elf on a Stick. My students are loving these quick creative writing prompts. They have been using them when they finish their work early throughout the day. I plan on creating writing prompts on a stick for each month. When I've completed a whole years worth I'll also bundle them for a discounted price. This should keep me busy over the next few weeks. Today, while surfing the net, I stumbled across an awesome new blog: Collaboration Cuties. Amanda and Stacia have the cutest ideas and a well stocked Teachers Pay Teachers store. 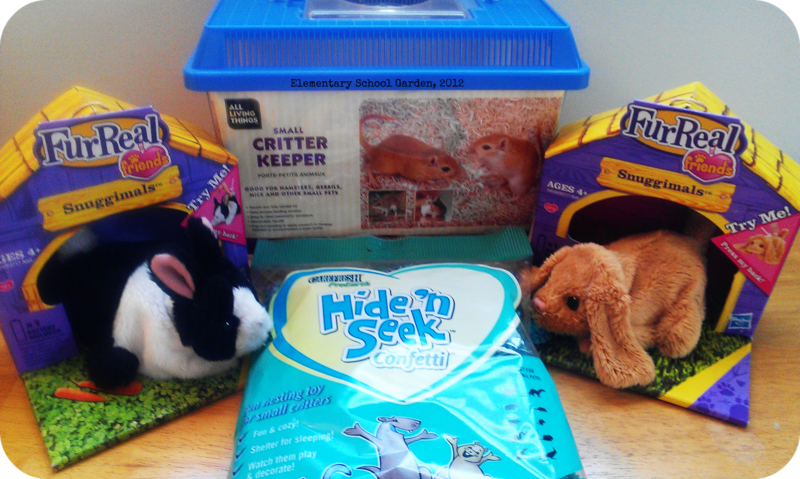 Stop by their blog before Wednesday for a fun giveaway! I have my first formal observation of the year this Thursday. To say that I am nervous would be an understatement. I don't just get butterflies in my stomach before an observation, I literally feel like their is an alien inside me trying to eat it's way out. You'd think after 6 years of teaching I'd be use to it by now. Truth is, I'm just as nervous for this observation as I was during my student teaching back in college. My fingers are crossed I don't stutter my words or trip. Only time will tell! So...you probably won't hear much from me this week but I promise a freebie this weekend if all goes well! It's my favorite Monday of the month...Monday Made It that is! 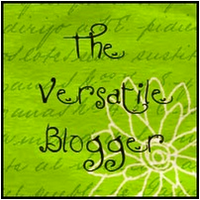 Oh, I just love Tara's crafty linky party! 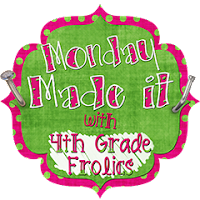 Her blog, 4th Grade Frolics, is where I found the inspiration for my first project. 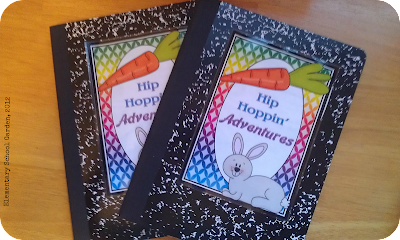 I've been looking high and low to find creative and fun ideas to motivate my 4th graders to write this year. 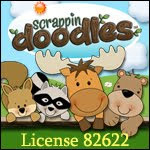 I'm hoping to inspire their creativity and help them to develop their inner author. 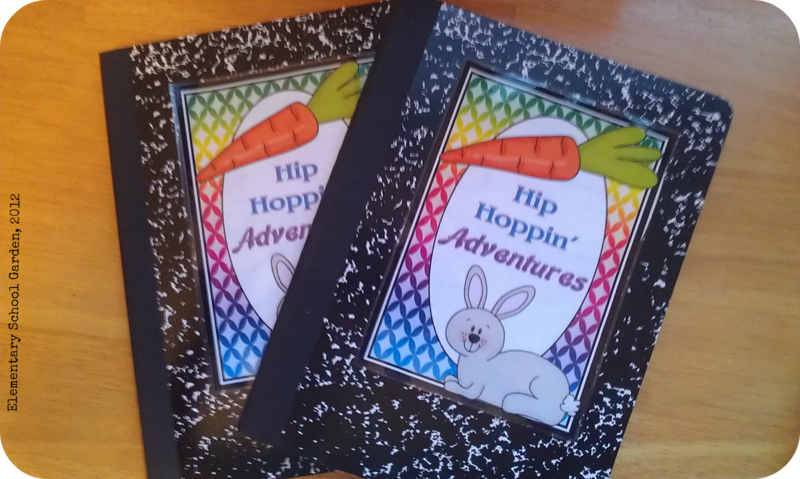 In order to motivate students to write at home I decided to make 2 creative writing take home journals. To kick off these journals I introduced our 2 new class pets! Aren't they cute? They are FurReal Friends and move when you push their backs. Their little tail wiggles and their head pops up and down. Adorable! During writing, I have been passing out good behavior tickets to students who have been working hard and putting their best effort into their writing. Students simply write their name on the ticket and it goes into our weekly drawing. 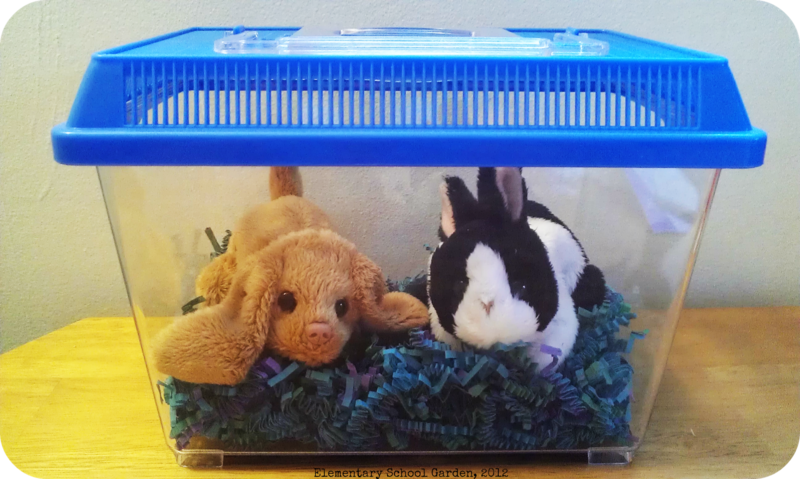 On Friday, I draw 2 names and these students win the opportunity to bring one of our class pets, and journal, home for the weekend. 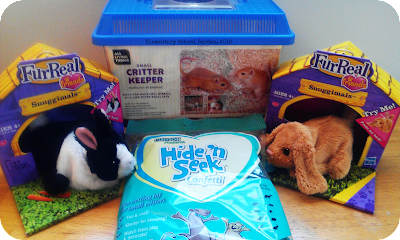 Their task is to write about our class pet's Hip Hoppin' Adventures while they are home. 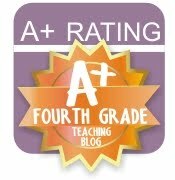 I created a journal cover, direction page, and good behavior tickets that you can snag at my Teachers Pay Teachers store for free. I've also been busy creating a lot of writing prompts for students to use if they finish their work early throughout the day. 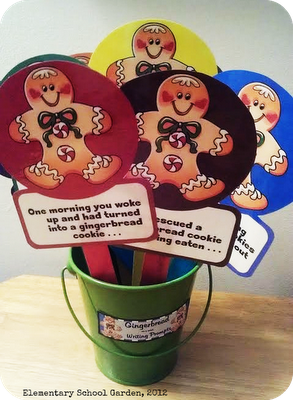 To start out with, I created Gingerbread on a Stick prompts as part of my Gingerbread Writing Centers pack. They are quick and easy to put together. Students just grab one during their free time and start writing! 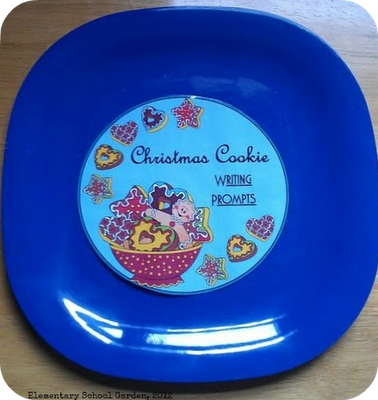 I also created some Christmas Cookie Writing Prompts. You can download them for free! I picked up a cheap plate from Dollar Tree and Glued on this sign. 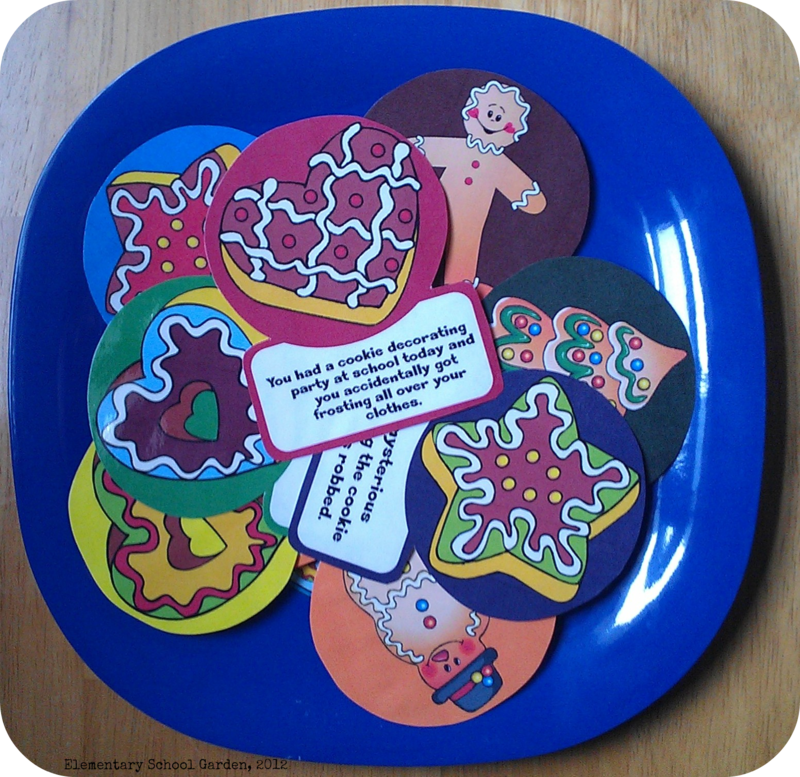 I printed, laminated, and cut out the Christmas Cookie Writing Prompts, and placed them on the plate. When students finish their work early they can grab a cookie from the plate. How do you motivate students to write? 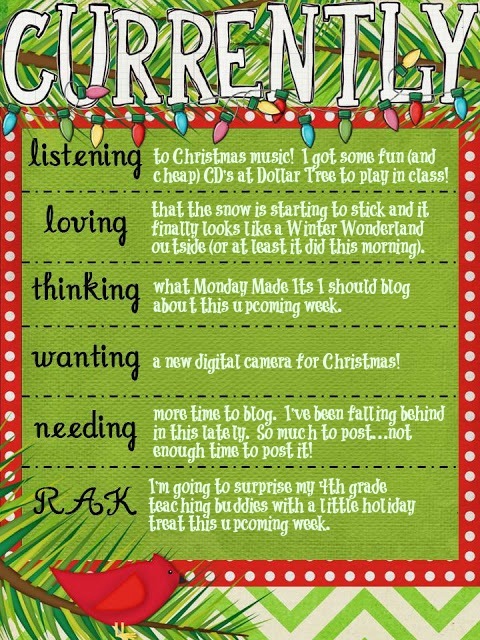 For more fun December ideas check out Monday Made it!